A certain puppy fanatic of cartoon fame may have a bad reputation, but she actually has a lot of great qualities. She is a great hostess; most people don’t know that about her. She attends many annual fundraising galas, and when she does, she’s always dressed to the K-9s. It is a bit unfortunate, we think, that she's mostly known for capturing Dalmatians so she could use their coats to make extravagant fur clothing (OK, writing it down it does sound truly terrible), BUT our favorite villain is more than that. She loves to throw themed wine and cheese parties and you have to admit, she's basically a fashion icon. We’re not saying everyone in the world should adopt her tactics to achieve high style, though, and that’s why we’re offering this Women’s Plus Size Cruel Boss Lady Costume. Now, she can be celebrated for her fashion contributions without a single visit to the pound. We’ve shown this to her, and she actually likes this look so much she reformed her love of fur and opted for the chic new approach. Phew! Nothing like saving a bunch of puppies on a Monday to make you feel good about yourself! If you’re also a lady who knows how to dress, follow the lead of our trendiest villain and try on this top and skirt, trimmed in faux Dalmatian fur. 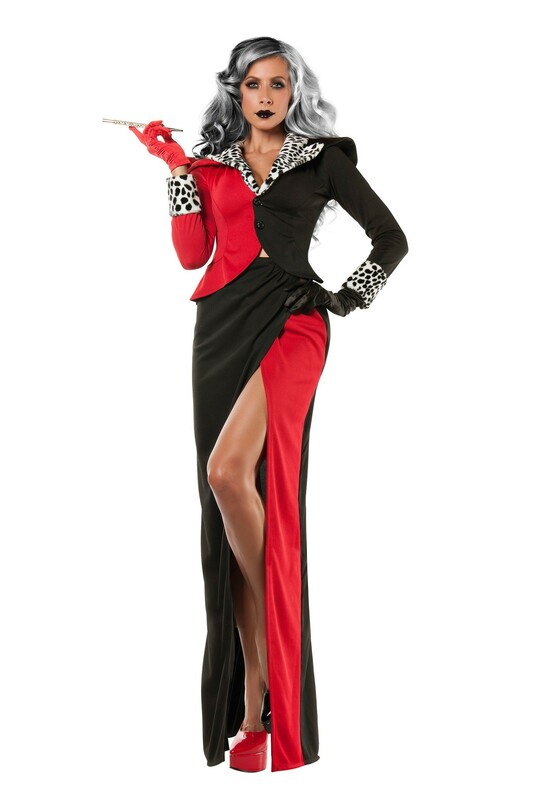 You’ll need a dramatic wig (and equally dramatic long cigarette holder) to accompany this ensemble. But otherwise, you’re ready to get out there and show the world just how unexpectedly lovely a cruel boss lady can really be!